The Timberwolves have officially launched their search for a new president of basketball operations to replace Tom Thibodeau, who was dismissed during the season, the team announced today in a press release. Jon Krawczynski of The Athletic first reported late on Tuesday night that Minnesota would seek a president of basketball ops. “In the absence of Tom, I want to thank all who picked up his responsibilities this past year,” Timberwolves owner Glen Taylor said in a statement, citing the work done by general manager Scott Layden and head coach Ryan Saunders. “… They worked through a season with many injuries requiring many challenges in our player lineup. We are incredibly grateful to them for all of their hard work and commitment to the franchise. According to Wojnarowski, the idea would be to reward Saunders with a multiyear extension – likely a three-year deal with a team option in the final season – and to keep Layden as the general manager, with a new president of basketball operations working above him. It remains to be seen if the Wolves will target candidates willing to work within that structure, or if the team will ultimately let its new hire make the call on Layden’s and Saunders’ futures. Sources tell Krawczynski that Taylor ultimately elected to open up a search for an executive about Layden in part because of the GM’s “messy handling” of Jimmy Butler‘s trade request and his inability to make a trade at February’s deadline. Krawczynski adds that the Wolves will be aggressive in their search, targeting a strong communicator who places high value on the draft and player development. The team won’t use a search firm during the process. Former NBA players Chauncey Billups and Calvin Booth have been cited as potential targets of interest for Minnesota, though it’s not clear if the club would feel comfortable elevating either one to a president of basketball operations role. Booth currently works in the Nuggets’ front office, while Billups has interviewed for high-level NBA management jobs in Cleveland and Atlanta in recent years. The Wolves also plan to look outside of Taylor’s “sphere” for candidates, writes Krawczynski. 11:57pm: Following up on Wojnarowski’s report, Jon Krawczynski of The Athletic tweets that the Timberwolves will seek out a permanent president of basketball operations, with the search beginning in earnest within the next few days. No final decisions have been made on Layden and Saunders, according to Krawczynski, who says the next president of basketball operations will help make that call. In his full story at ESPN.com, Wojnarowski writes that the Wolves had been surveying the marketplace for potential executives but never made contact. Woj also reports that Saunders will likely receive a three-year contract with a team option on the final season. 11:19pm: After the Timberwolves dismissed head coach and president of basketball operations Tom Thibodeau earlier this season, Ryan Saunders assumed coaching duties, while GM Scott Layden became the club’s head of basketball operations. Now, Saunders and Layden are poised to keep those jobs going forward. According to ESPN’s Adrian Wojnarowski (via Twitter), the Timberwolves are finalizing plans to retain Layden and Saunders. While Saunders has a modest 17-24 record since taking over as the Wolves’ head coach, the team has liked the job that Flip Saunders‘ son has done managing minutes and developing the organization’s young players. Karl-Anthony Towns, in particular, has hit his stride since the coaching change, averaging 26.8 PPG, 12.4 RPG, and 3.7 APG on .541/.422/.838 in his 37 games under Saunders. Of course, those numbers can be partially attributed to Jimmy Butler‘s departure. A March report had suggested that Saunders would likely be retained, but the decision to bring back Layden is a little more surprising. Layden had worked alongside Thibodeau in Minnesota’s front office for the last few years, and there was a sense that the Wolves might explore the market for a new head of basketball operations — Chauncey Billups and Calvin Booth were among the potential candidates linked to the club. Ryan Saunders, who replaced Tom Thibodeau as Minnesota’s coach in early January, appears likely to return to the position next season. Marc Stein of The New York Times (via newsletter, which you can subscribe to here) writes that “all signs” point to the Timberwolves retaining the 33-year-old first-time head coach, citing the strong bond between Saunders and Karl-Anthony Towns. Towns’ co-sign and improved performance may overshadow the fact that Saunders underperformed from a win-loss perspective during his limited time in the role. The team has gone 14-19 since he took over duties. Stein adds that there is uncertainty around general manager Scott Layden‘s future. Owner Glen Taylor is fond of Chauncey Billups and has interest in hiring the ESPN analyst for the GM role. However, there’s pessimism within league circles about Taylor being able to put an attractive enough offer together for it to make sense for both sides. Billups has previously expressed a desire to lead a front office. He’s interviewed with the Hawks and Cavaliers in recent years. Nuggets executive Calvin Booth should be considered a strong candidate for the position if Taylor dismisses Layden, Stein adds. Booth previously played in the NBA and he worked in Minnesota’s front office before moving on to Denver. Jazz reserve guard Dante Exum will miss at least two more weeks due to a bone bruise on his left ankle, Tony Jones of The Athletic tweets. Exum hasn’t played since January 5. He was averaging 7.4 PPG and 2.7 APG with the second unit in 39 games. Exum signed a three-year contract with an annual base salary of $9.6MM over the summer. The Timberwolves have yet to contact any potential executives or coaches as possible replacements for GM Scott Layden and interim head coach Ryan Saunders, according to Jon Krawczynski of The Athletic. Saunders, son of former Minnesota coach Flip Saunders, was elevated when owner Glen Taylor fired Tom Thibodeau. Taylor is expected to use the rest of the regular season to evaluate Layden and Saunders, Krawczynski adds. The Thunder showed a lot of interest in Bucks swingman Khris Middleton prior to the 2012 draft, according to ESPN’s Zach Lowe. Middleton tore the meniscus in his right knee in early November of his final college season with Texas A&M and it affected his play, causing his draft stock to tumble. He was selected in the second round by Detroit with the 39 overall pick. The Trail Blazers are in a better spot than they were last season entering the stretch run, an Associated Press story notes. They were sixth in the West a year ago at the All-Star break but held the fourth spot this season. Moreover, the Blazers picked up some reinforcements this winter by signing center Enes Kanter and trading for guard Rodney Hood. It wouldn’t be surprising if Nuggets forward Trey Lyles signs his $3.7MM qualifying offer, Mike Singer of the Denver Post opines. Lyles’ production has fallen off recently and he may not even stay in the playoff rotation, Singer continues. The Nuggets are thin at the power forward spot, which would increase the odds of them extending the qualifying offer and making Lyles a restricted free agent. However, he’s a poor 3-point shooter and will probably have a tough time attracting an offer sheet, Singer adds. Karl-Anthony Towns has entered the league’s concussion protocol after being involved in a car accident on Thursday, Michael Scotto of The Athletic tweets. The Timberwolves’ star big man will not play against the Knicks on Friday. That will end his streak of 303 straight starts. Contrary to a report that emerged last night in the wake of Tom Thibodeau’s firing in Minnesota, former Bulls coach Fred Hoiberg is not an “immediate candidate” to become the team’s next coach or president, a source tells Jon Krawczynski of The Athletic. Interim coach Ryan Saunders will be given an opportunity to earn the job on a permanent basis, Krawczynski adds, and he has strong support from his players, who respect his work ethic and welcome his approachable nature as a change from Thibodeau. The organization will consider hiring an assistant who has experience as a head coach to help Saunders with the challenges of his new position. GM Scott Layden was retained last night and will likely remain in place for the rest of the season, but he may need the team to make the playoffs to keep his job beyond that. While the Wolves have a disappointing 19-21 record, the decision to part with Thibodeau was based on business as much as basketball, Krawczynski writes. The coach had become unpopular with fans, who routinely booed him every time his name was announced in pre-game introductions. Even worse, they were staying away, as Minnesota has dropped to 29th in home attendance after ranking 21st last season. The organization didn’t want to keep an alienating presence in place with a season ticket drive looming. It’s no secret that owner Glen Taylor was unhappy with Thibodeau and Layden over how they handled the situation with Jimmy Butler before he was traded to the Sixers. Taylor commented several times that he believed both men were dragging their feet on Butler’s trade request and that they let the volatile star hijack the team during training camp and the early season. Thibodeau has long had a reputation of giving heavy minutes to his starters, and several players complained about poor communication over their roles. Krawczynski reports that Gorgui Dieng, who has fallen out of the rotation after signing a huge contract, was “openly seething” in the locker room after Friday’s game. Tyus Jones, Anthony Tolliver and Jeff Teague have also expressed frustration over their status on the team. The Timberwolves have fired Tom Thibodeau as their head coach and president of basketball operations, according to Shams Charania and Jon Krawczynski of The Athletic (via Twitter). After dealing with the Jimmy Butler fiasco, the Timberwolves currently sit at 19-21 and are on the outside looking in on the Western Conference playoff picture. Krawczynski is also reporting that Ryan Saunders will take over as head coach on an interim basis while Scott Layden will still serve as the team’s general manager. Meanwhile, Adrian Wojnarowski of ESPN is reporting that Fred Hoiberg is a serious candidate to become the team’s GM or coach. Hoiberg previously served as the Timberwolves’ assistant GM before leaving to be the head coach at Iowa State University. Wojnarowski also believes that Monty Williams may emerge as a serious candidate for the coaching position due to previous interest that the Timberwolves had in bringing Williams in as head coach. Team owner Glen Taylor spoke to the media about the decision to fire Thibodeau, stating that “we’ve gone up through halfway through the season and I don’t think we’re where we thought we would be or where we think we should be.” Taylor also expressed a desire to make the playoffs, believing that making such a change with half the season left may give the Wolves a chance to do so. 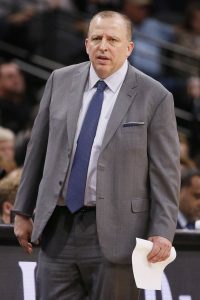 In two and a half seasons with the Timberwolves, Thibodeau had a 96-107 regular season record, leading the club to the playoffs last season for the first time since 2004. However, his decision to acquire Butler from his old team in Chicago ultimately led to his downfall. Although the All-NBA swingman helped Minnesota win 47 games in 2017/18, his offseason trade request – and Thibodeau’s initial reluctance to grant that request – created several weeks of drama within the organization and didn’t reflect well on Thibs. Thibodeau’s firing represents a continuation of a trend in the NBA’s head coaching ranks. Within the last two years, four head coaches who held president of basketball operations titles within their respective organizations have had those responsibilities removed or have been fired altogether. Mike Budenholzer (Hawks), Doc Rivers (Clippers), and Stan Van Gundy (Pistons) were the others. Gregg Popovich of the Spurs is now the only NBA head coach who is also his team’s head of basketball operations. Tom Thibodeau sold Timberwolves‘ owner Glen Taylor on passing on the initial offer from the Heat centered around Josh Richardson because he believed that Pat Riley would come back with a better offer down the road (the Heat never returned with Richardson on the table in subsequent trade talks). Taylor considered firing Thibodeau and GM Scott Layden this past summer before the Butler saga broke out and continues to think about the possibility of replacing both of them. According to Woj, the Timberwolves desperately tried to find other trade partners throughout the past week, including reaching out to the Pelicans and Wizards, to no avail. The Wolves actually had “extensive” discussions with the Pels, but New Orleans wouldn’t offer Jrue Holiday or multiple draft picks. Washington, meanwhile wouldn’t offer Bradley Beal, which comes as no surprise. The Sixers initially offered the Timberwolves their choice of Robert Covington and Dario Saric in an offer for Butler before eventually agreeing to include both players. The Sixers believe they are operating out of a position of leverage when it comes to dealings with Butler. According to Woj, there are league executives that understand that Butler must be on his best behavior in order to get the full five-year max contract he desires this summer. The Rockets‘ latest attempt to get Jimmy Butler from the Timberwolves by offering Brandon Knight, Marquese Chriss and four first-round picks is a non-starter, according to Malika Andrews of ESPN, who hears from sources that Minnesota won’t consider any deal that doesn’t include Eric Gordon. Coach Tom Thibodeau is focused on returning to the playoffs and wants a trade that will benefit the team right away. Knight and Chriss are both injured and neither has been effective over the past two seasons in Phoenix. Thibodeau still has three years and $24MM left on his contract, but there have been rumors that his job may be in jeopardy if the Wolves commit to a full rebuilding project. Plan A for Thibodeau is to hold onto Butler for as long as possible — possibly until February’s trade deadline — to help with the playoff push, Andrews adds. However, the team is off to a 2-4 start, including a 30-point loss last night to the Bucks, so that strategy isn’t off to a great start. Butler, who started the process with a trade request last month, has received assurances from owner Glen Taylor that the team will continue to pursue a deal, according to Andrews, who hears from sources that another serious effort will be made about 10 to 15 games into the season. Taylor has put GM Scott Layden in charge of working out a trade while Thibodeau coaches the team. The Heat and Sixers remain interested and Taylor has been hoping both teams will consider increasing their offers. Butler also defended his actions at today’s session, saying, “A lot of it is true. But you got to think I haven’t played basketball in so long and I’m so passionate. I love the game… All my emotion came out at once. Was it the right way to do it? No, but I can’t control it when I’m out there competing.” (Twitter link). Butler spent much of the practice on a profanity-laced tirade, mostly aimed at Towns, Andrew Wiggins, coach/executive Tom Thibodeau and GM Scott Layden, reports Chris Haynes of Yahoo Sports. Butler taunted Towns and Wiggins by yelling, “They soft” as he faced them in the scrimmage. Neither player confronted him for his actions. Haynes adds that Butler has warned team officials in the past that he might find ways to express his displeasure if his trade request isn’t met. The organization has reacted poorly ever since Butler made his trade demand three weeks ago, argues Britt Robson of The Athletic in a roundtable discussion. Robson contends the best response would have been to trade Butler quickly and start rebuilding the team around Towns and Wiggins. Instead, Thibodeau and Layden publicly expressed a desire to work things out with Butler and dragged their feet on numerous trade offers. Robson also blasts Towns and Wiggins for not playing with more desire in an effort to prove that Butler is wrong about them.